I've snacked on wasabi peas before on this blog and have always enjoyed them, although they can be a little oily after a full packet, also a little too crunchy on the teeth and can dry out my mouth. 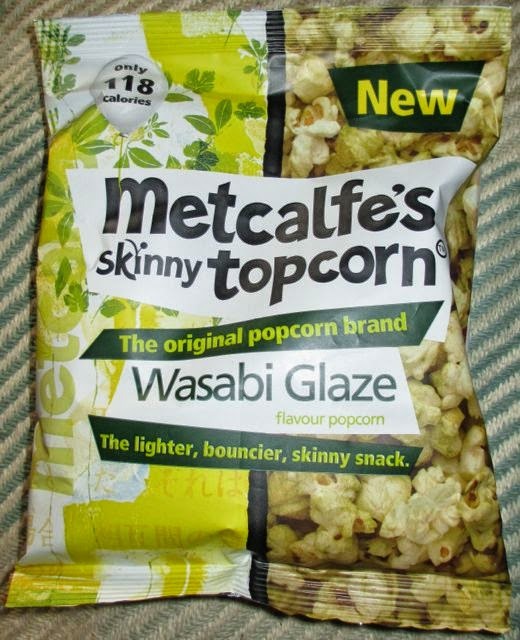 This Metcalfe’s Skinny Topcorn Wasabi Glaze flavour popcorn is the second of the popcorn flavours from Metcalfe I’ll be blogging about, the first was Heat and Sweet. There was predominantly a popcorn smell, followed by a sharpe mustard like wasabi whiff on opening the packet. There was a sweet popcorn taste initially, almost caramel sweet in fact, which was very pleasant indeed and also slightly surprising, as I had been expecting a wasabi kick straight away. This sweetness was quickly replaced by a fiery zing from the wasabi glaize, which made my nose tingle pleasurably. I found this popcorn flavour to be very moreish, with a good-for-me feel about them. I believe they are an excellent alternative to spicy crisps and the harder on the teeth wasabi peas, which are not for the faint toothed. Every mouthful of this Wasabi Glaze Popcorn had a lovely sweet pleasing kiss followed by an almost electric tingly punch of wasabi. I would definitely have these again, and am rather looking forward to the second packet stashed in my Foodstufffinds grub corner. 25g bag has 118 calories, with 4.2g sugar and 5.5g fat. Suitable for vegetarians. For ingredients please see photograph.